Cubs Win! Cubs Win! Holy Cow!! After Wednesday’s horrible loss, it felt like the Cubs wouldn ‘t win a game all year. They did get the win today and prevented Milwaukee from sweeping the Cubbies. If you told me that it would be Ryan Dempster who would silence the mighty Milwaukee bats, I would have laughed at you, but sure enough, he did. home, trying to one-hop the ball to catcher Geovany Soto. 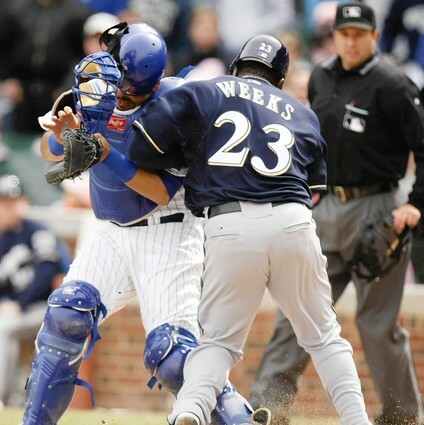 The ball went a little towards the third base line and Weeks collided full-force with Soto, knocking the catcher over. Dempster tried to recover the ball and flip it to Soto as Gwyn Jr was coming home, but the ball sailed over his head. Cubs were down 2-0 in the first. Fukdome was charged with an error, but I don’t know why. Maybe something about that hit woke the Cubs up, because they finally began to look alive. The Cubs finally got some breaks go their way. In the second Ramierz walked, then reached third when Fukudome doubled, thanks in part to the bad defense of left fielder Ryan Braun. Mark DeRosa then hit a ball that took a bad-hop at third, scoring Ramirez. Soto hit a sac fly to tie the ball game up. Boy, they moved Braun to left so he wouldn’t hurt them defensively, but now he may haunt them at third. There were a lot of other balls that Braun misplayed today. The Cubs finally were able to turn the momentum in the bottom of the fourth. Milwaukee starting pitcher Dave Bush started out the inning by walking Fukudome. Fukuidome stole second on a horrible two bouncer by Kendall (four different Cubs were able to steal bases on Kendall). Bush then hit DeRosa and then walked Soto to load the bases. Felix Pie was up, but struck out on three high fast balls. Doh! Then Dempster tried to bunt with two strikes, but struck out. Doh! It looked bad. The Cubs had the bases loaded and no outs, and now the runners hadn’t move and Bush was one out away of getting off the ropes. But Alfonso Soriano, now back in the leadoff spot, actually drew a bases loaded walk. No, that is not a typo. Soriano actually was able to draw a walk. Fukudome crossed the plate and the Cubs had their first lead of 2008 and wouldn’t give it up the rest of the game. It would have been a lot nice to have cleared the bases on a hit, but at that point the Cubs needed to get at least one in. I think if Bush would have gotten out of that inning, the momentum would have shifted towards Milwaukee, and we might have been looking at a sweep. faced. Only four of his 18 outs were on balls hit to the outfield; the rest were on grounders and strikeouts. How clutch was Dempster. In a game the Cubs needed to avoid the sweep, he slammed the door on a great offensive team. Marmol pitched two innings, giving up one run on two hits and a walk. Kerry Wood got the first save of his career and the Cubs were in the win column. So the Cubs got their first win, Soriano got his first hit of the season, as did Aramis Ramriez, a home run. Dempster got his first win as a starter in a Cubs uniform, and Kerry Wood got his first careet save. Now come the Houston Astros. Rich Hill will make his first start of the season against Chris Sampson. Hill really struggled this spring, so I wonder how long the leash is for him. Houston can’t pitch,but they can still rake the ball. The Astros have scored 12 runs in four games, but they have given up 15 runs and are 1-3. On Saturday, Jason Marquis facesRoy Oswalt(gulp), and on Sunday, Zambrano will face Wandy Rodriguez. Zambrano was recently told to eat more bannanas and not drink coffee or red bull. You mean to tell me no one has ever told Z to cut down on the caffine!!!!??? ?